HIRPORA, SHOPIAN DISTRICT, INDIAN ADMINISTERED KASHMIR, INDIA - APRIL 25, 2014: Family and friends mourn the death of Zia-ul Haq, 29, a Kashmiri primary school teacher and election official during his funeral on April 25, 2014 in the village of Hirpora, approximately 60km's south of Srinagar, Shopian District, Indian administered Kashmir. 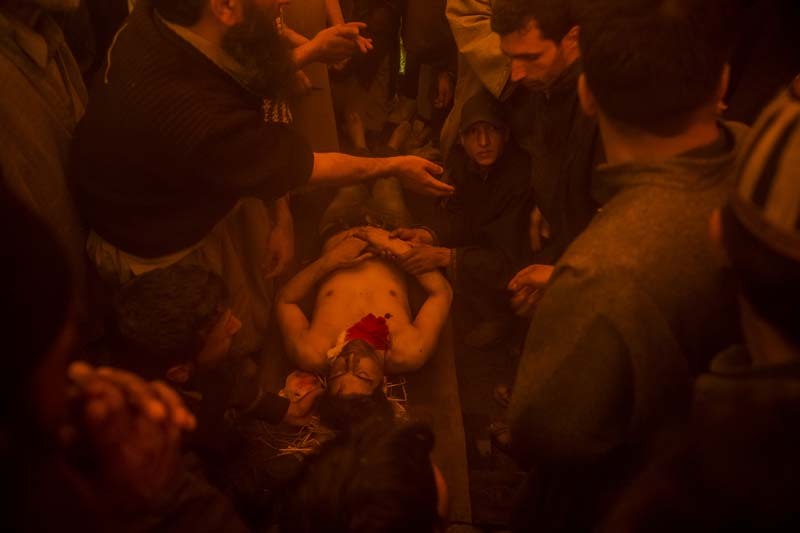 Zia, an Indian poll official was killed soon after voting for the ongoing general elections, when suspected rebels fatally shot him and wounded four others in an attack on a bus in the Indian-controlled portion of Kashmir. Voter turnout was extremely low across the district, with voting being boycotted in villages with numerous polling stations not even registering one vote. Narendra Modi, leader of the Bharatiya Janata Party, won a landslide victory in India's 2014 general elections, which took place between April 7 and May 12. With over 550 million votes cast, it was the largest election in history. It was the first time since 1984 that a party has won enough seats to govern without the support of other parties. Modi, the former governor of Gujarat State, led his party to defeat the Indian National Congress party, which has led the central government for a total of 49 years since the country's 1947 Independence. In the run up to the election, with India's economy faltering and the government plagued by corruption scandals, BJP were able to position itself as the party of the urban middle class, an increasing constituency as more Indians move from the countryside to cities and those cities, in turn, become more prosperous.